Follow up to my general question, where @eyllanesc has kindly answered my question. Out of curiosity, I tried changing to code to check against a string rather than 1 and all the rows turned gray. then all the rows turn yellow. What gives? Will anyone help me understand? N.B. 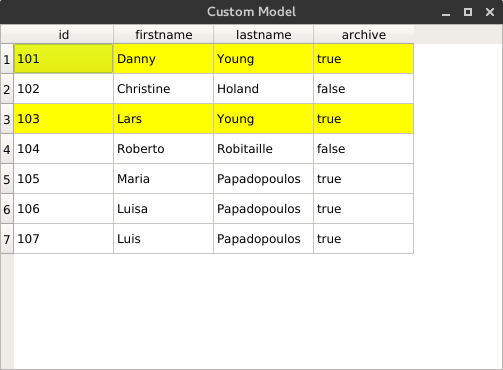 I can replicate the desired behaviour by adding another column to the SQL query (using CASE WHEN etc.) and then using setColumnHidden(col, True) to hide the test column.